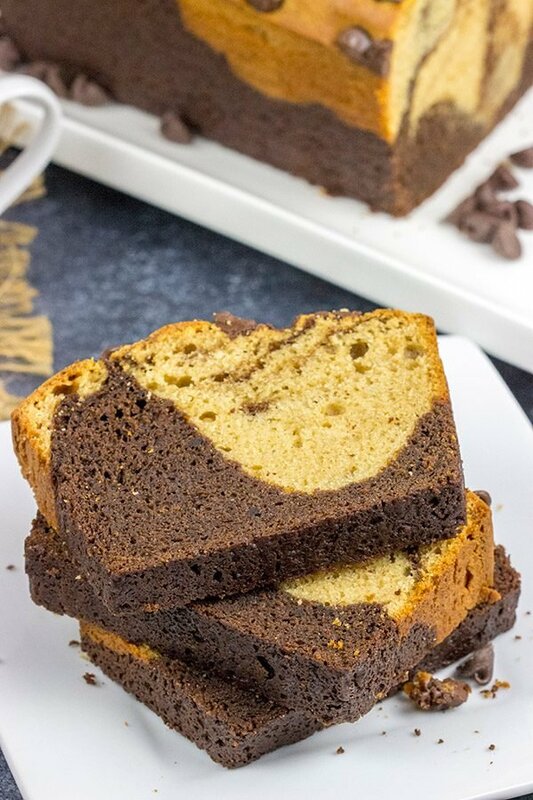 Chocolate Peanut Butter Bread - Fun and delicious quick bread! Can’t decide between chocolate and peanut butter? Go with both! 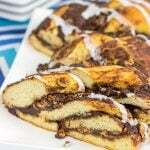 This swirled Chocolate Peanut Butter Bread is a fun and tasty recipe! Did you know that there are 3 cities in Pennsylvania with ‘peanut’ in their name? Yup, there’s Peanut, Pennsylvania. Then there’s Upper Peanut, Pennsylvania. And (you guessed it) there’s also Lower Peanut, Pennsylvania. To celebrate their namesake, the city of Peanut created the world’s largest PB&J sandwich back in the mid 1990’s. This 40-foot long sandwich contained 150 pounds of peanut butter and 50 pounds of jelly. 150 pounds! That’s a serious amount of peanut butter right there. What exactly does one do with a 40-foot long PB&J sandwich? I’m assuming you can cut it up and share it with the local residents of Peanut, PA. However, even a 6″ section of that sandwich contains almost 2 pounds of peanut butter! I hope they invited their neighbors from Lower Peanut and Upper Peanut over to help with that project! If you open our pantry, you’ll always find at least 2 jars of peanut butter. You see, when it comes to sandwiches, I’m 100% in the crunchy peanut butter camp. I love the extra crunch in there. (It reminds me of putting chips on my sandwiches back when I was a kid. Did y’all ever do that??) But when it comes to baking, I am 100% in the creamy camp. In my opinion, creamy peanut butter just incorporates better into recipes. 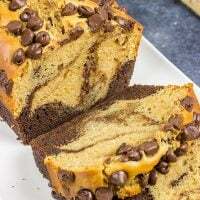 And speaking of recipes, this Chocolate Peanut Butter Bread recipe is a new favorite around here! Years ago, my mom typed up all of her recipes and sent the Word document to both me and my sister. That project must have taken her weeks as I remember her recipe box in the kitchen was stuffed full of family favorites. I love having the electronic version as I can just go in and search for a word to zoom in on the recipe quickly. No more digging through piles of index cards and magazine clippings wondering what the heck happened to that recipe! I was looking in that recipe file a couple of weeks ago, and I stumbled across a peanut butter bread recipe. To be honest, I don’t ever remember my mom making this bread when I was a kid. Maybe she did, and I just forgot about it? I dunno. But I stopped and looked at that recipe, and it intrigued me. A peanut butter bread? I’ve made plenty of quick breads over the years, but never a peanut butter version. I baked up a loaf of that bread, and it was delicious! 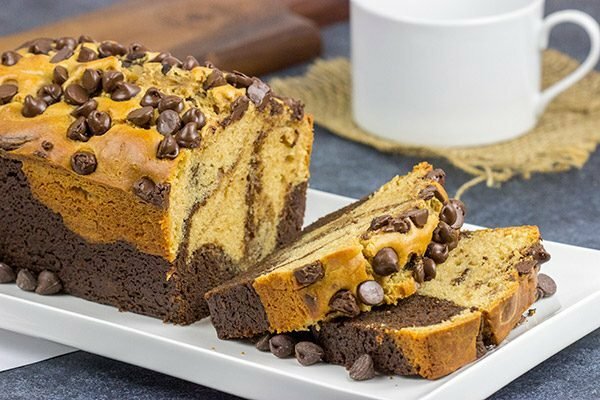 Laura and I were eating a piece that night for dessert when she suggested that I swirl in some chocolate chips…and that’s how this Chocolate Peanut Butter Bread came about. Instead of swirling in chocolate chips, I went all-in and swirled chocolate batter into the peanut butter batter. (I did use some chocolate chips on top, though.) Chocolate + peanut butter are a classic combination, and this Chocolate Peanut Butter Bread was a huge hit in our house. In fact, I went in and added this recipe to the family Word document so that Robbie will have the recipe once he gets older. It’s a good one! Enjoy! 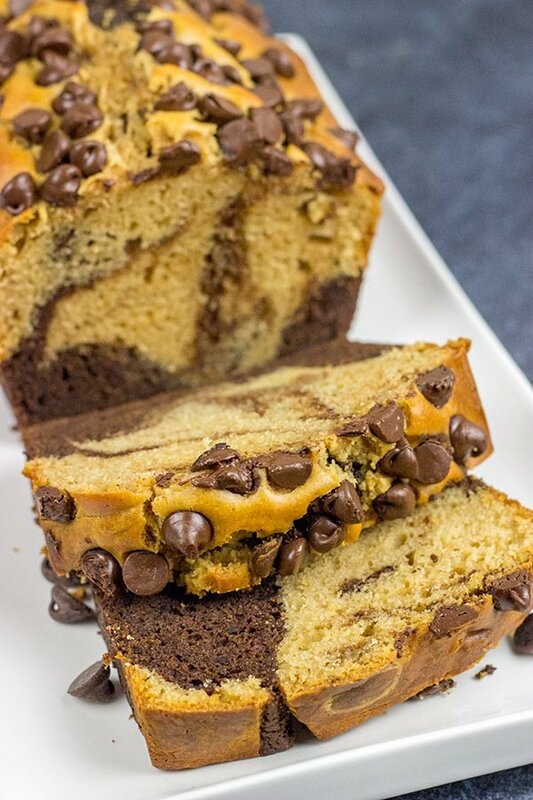 Did you make a loaf of this Chocolate Peanut Butter Bread at home? Leave a comment! Or snap a photo and share it with me on Instagram (@Spicedblog). Can't decide between chocolate and peanut butter? Go with both! 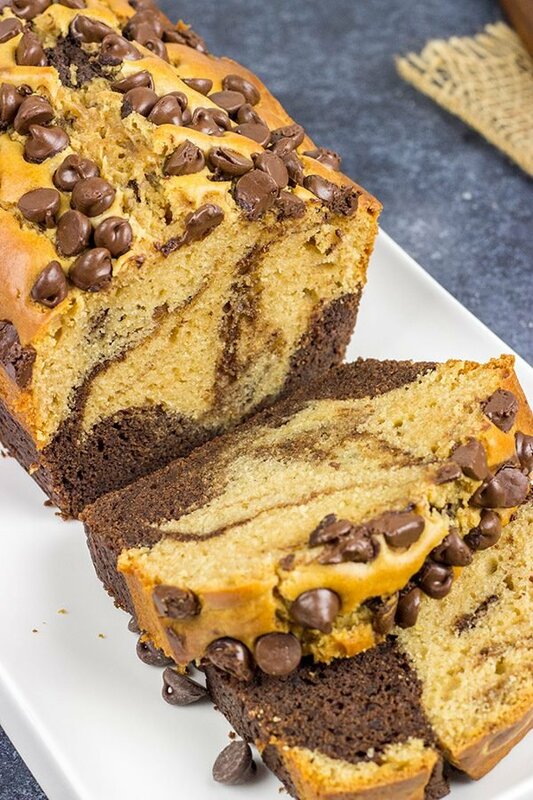 This swirled Chocolate Peanut Butter Bread is a fun and tasty recipe! Using a large bowl, add flour, brown sugar, baking powder and salt; stir until well combined. In a separate bowl, add milk, egg and peanut butter; stir until well combined. Pour wet ingredients into the bowl with the dry ingredients; stir until just combined. Using a large bowl, add flour, brown sugar, cocoa powder, baking soda, baking powder and salt; stir until well combined. In a separate bowl, add sour cream, vegetable oil, egg and vanilla extract; stir until well combined. Grease and flour a standard bread pan. Pour the peanut butter batter on top of the chocolate batter. Use a table knife or large spoon to gently swirl the two batters together. Sprinkle chocolate chips on top before baking. Let bread cool in pan for 30 minutes before transferring to a cooling rack. 150 lbs?! That is A LOT!! Though a lot smaller, reminds me of those huge party Subway subs you could get years ago. I don’t think they make anymore, but they were quite the spectacle. And who woulda thunk that a town would have ‘peanut’ in the name. Though, we do have some funny ones here in NL. You can never ever go wrong with chocolate and pb so this one would be devoured in no time at all. 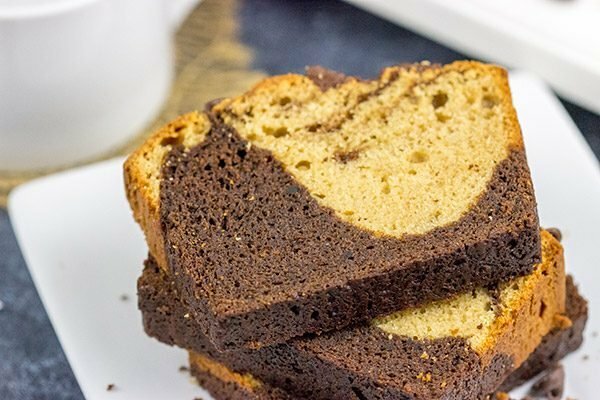 All my morning coffee is missing right now is a slice or two of this delicious bread! Care to send me some 😉 Hope you’re having a great week, David! How fun would it be to live in a town named Peanut!? I bet there are so many awesome puns going on there. 🙂 Speaking of peanuts (and peanut butter), this bread is amazing! I ate it as a mid-afternoon snack as I’m not a huge fan of chocolate in the morning. So good! I’ll be happy to send a couple slices your way, Dawn! Now I want to move to Upper Peanut. I love that name! And considering my love for peanut butter I think it’s only appropriate. 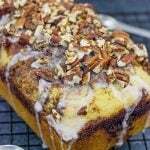 Quick breads are one of my weaknesses, since it’s basically cake I can put butter on–you know I’ll be making this one soon! I tell you what…you move to Upper Peanut, and I’ll move to Lower Peanut. Then we can make all sorts of peanut-inspired dishes. Deal? I’ll start off with another batch of this swirl bread. So fun to make…and even more fun to eat! Thanks, Kelsie! You can never go wrong with peanut butter and chocolate. This bread looks totally mouthwatering! I had no idea about the ‘peanut’ towns! We have some crazy town names in Oregon too – ‘Boring’ is my personal favorite. Wait. There’s a Boring, Oregon? That’s hilarious!! Haha! Let’s just say this bread didn’t last long around our house either, Alexandra! 🙂 Thanks so much, my friend! The town of Peanut sure made one big ‘ol sammy. You have to wonder about all the logistics in making a sandwich that big. 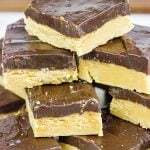 I’m not a fan of peanut butter, but my family loves it so I do make them peanut butter treats. They’s love this bread – especially the chocolate chips on top! It would be fun to live in a town called Peanut. 😀 This bread (or shall I say, cake) is brilliant! So often you post something I want to be ready and waiting with my coffee the next day. This is no exception.